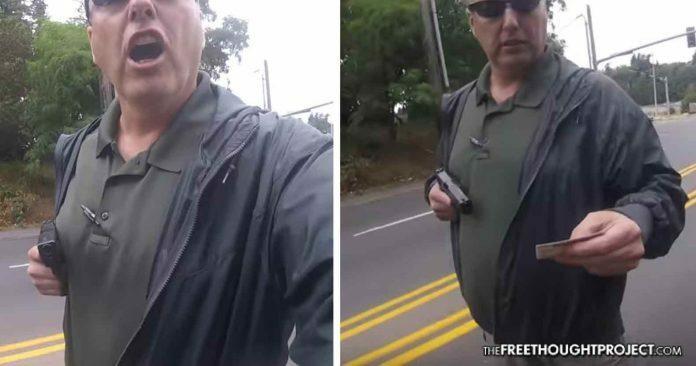 A road raging cop, who was caught on video holding an innocent man at gunpoint and illegally searching him will not be fired and, instead, will simply receive a five day vacation. Seattle, WA — Alex Randall was on his way to work last year on his motorcycle when he was assaulted with a deadly weapon by King County Sheriff’s Department detective Richard Rowe. The detective was in the midst of a power trip mixed with road rage when he held an innocent man at gunpoint. And, no one would’ve have known about it had Randall not been filming. “This video shows the boldness of the King County Sheriffs Deputies and lack of fear of repercussions in threatening and intimidating an unarmed citizen with excessive use of force,” Randall wrote on YouTube.